I questioned who was making the Filipino food at the Kalan Kitchen Dinner pop-up in Orange County, California, because each dish was refined, polished, and tasted like a seasoned chef had made it. It was not until after the dessert course when the Chef duo Kyle Barretto and AJ Santiago came out of the kitchen to introduce themselves to us. To my surprise, they are young chefs! What a pleasure it was to dine at their first ever Filipino Dinner Pop-up. Barretto and Santiago became friends when they both worked together at a restaurant in La Verne. They hoped to one day cook their own version of Filipino-inspired food and decided on collaborating together. “We have been following what other Filipino Chefs have been doing this year and [coincidentally] have attended their Filipino dinner pop-ups. 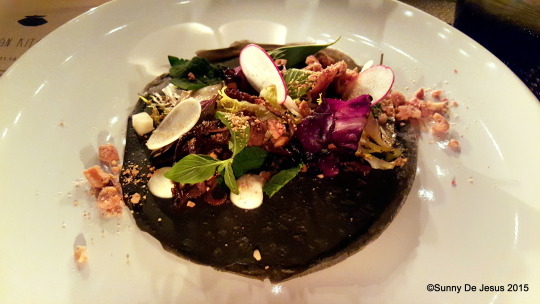 We’ve dined at LASA and also at Irenia Supper Club” said Chef Kyle Barretto. “We figured that 2015 was the time to do our own pop-up, because the timing was right,” added Chef AJ Santiago. Their pop-up moniker “Kalan” is the Filipino Tagalog word for an earthen cooking stove. 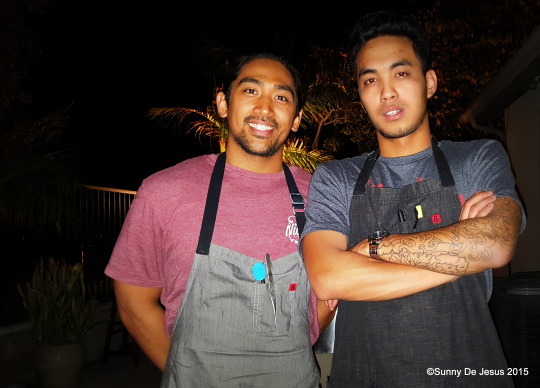 I would have to agree with these young chefs that 2015 is the year for Filipino food. It has been inspiring to watch and experience the New Wave of Filipino Cuisine in the Southern California area as they are setting the standard for the new Filipino cuisine will be. The old school way of dining on Filipino food (Turo-Turo style means you point to your food from steam tables on a counter) is for the older generation of Filipino-Americans who want something familiar to like it is in the Philippines. I am positive that you would agree with me that the New Wave of Filipino Cuisine by these young Filipino chefs like Barretto and Santiago, who have either been groomed in culinary school or worked their way up in fine dining restaurants, are setting a new standard of Filipino cuisine for the American population who are curious for a unique Filipino food dining experience. Bluntly, they prefer not to dine in a modest traditional Turo-Turo Filipino restaurant. 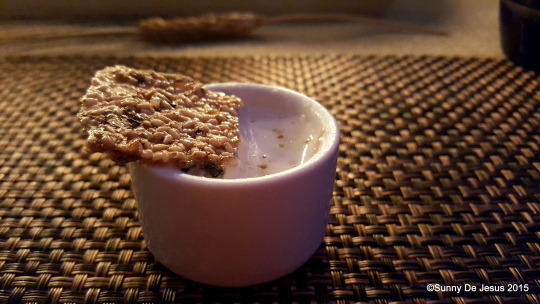 The amuse bouche named Amusal Ng Kampeon (translated in English as The Breakfast of Champions) was a better interpretation of the Filipino version of Champorado; a chocolate rice porridge. It was amazing, because the Sesame Crisp was like eating sesame candy and the Rice Porridge was more on the savory side to accommodate to the fact that we were eating dinner instead of breakfast. I somehow missed the smoked anchovy on the first taste, but my palate finally picked it up after mixing the porridge a bit. I am a huge fan of ceviche and the Filipinos have their own version of it called Kilawin or Kinilaw, which is typically a raw seafood appetizer. The chefs of Kalan Kitchen made an incredible Kilawin with Ocean Trout. 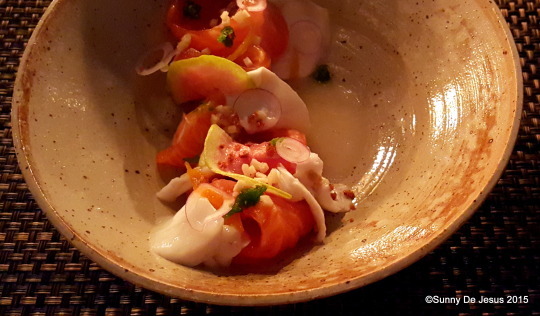 I loved the flavor of the Coconut Vinaigrette and the use of the ocean trout, a fish that looks like salmon and is uncommon in Filipino cuisine. The fish had a great texture and picked up the flavors from all the other ingredients. The vinaigrette wasn’t so acidic, but balanced. The guavas and the coconut added fruity nuances. The entire components of the dish presented beautifully too. It was nice to visually see what I was eating, which made me appreciate this dish even more. The Lumpiang Sariwa was the gorgeous one of all the dishes by Kalan Kitchen. It was so pretty that I really didn’t want to eat it. The chefs did a great job with their version of the Filipino version of a Fresh Spring Roll; having redefined it with a gourmet twist! The Adobo Squid wasn’t too fishy tasting and it had a great texture, not so chewy. There were plenty of fresh herbs for aromatics. The Pickled Jicama gave it the acid note it needed. I was equally impressed with the fresh Lumpia Wrapper aka Rice Crepe. For one thing, it was made with squid ink, which is not common in the traditional version. It was also spongy, a texture that I liked as it added structure to the crepe and never fell apart in my hands. With the Prawn Sauce added, the entire Spring Roll tasted wonderful. The key was the addition of those fresh herbs. This dish was lovely. The meat of choice in the Philippines is pork, because Lechon is the national dish. 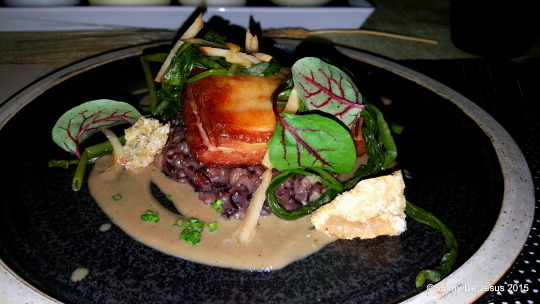 As such, it didn’t surprise me that one of the entrees served at the first ever Kalan Kitchen pop-up was a Lechon dish. They called it Lechong Mang Thomas on the menu and it was prepared with a piece of pork belly. Accompanying it was some Mindanao Black Rice, Kang Kong (Water Spinach), a granny smith apple, and a sweet and sour liver sauce (their own version of the infamous Philippine Mang Thomas All-purpose Liver Sauce condiment). I really loved how everything tasted together. The portion was the right amount to eat on the plate with plenty of Kang Kong (Water Spinach) to notice vegetables were not missing on the plate. Eating Lechon can be heavy at times particularly when the fat from the pork has not rendered enough during the roasting process. However, the chefs at Kalan Kitchen did a superb job with their Pork Belly Lechon. The meat was juicy and fork tender. The pork skin was crispy too. They definitely rendered almost all of the fat from the pork belly. Just as the evening turned into night, the alcohol from the Manila Mule Cocktail made with Calamansi started to wear off and I was alerted by a friend that it was dessert time! I was soooo craving dessert too. 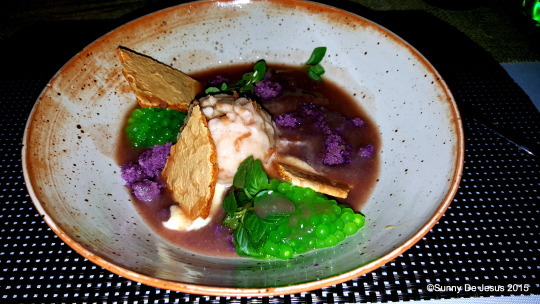 The Pièce de résistance in my book was the final course; a deconstructed Halo Halo by Kalan Kitchen. The Halo Halo is a Filipino version of a shaved ice dessert. Traditionally shaved ice is topped with various sweet beans, fruity jellies, shavings of young coconut, Ube Ice Cream, and some velvety Leche Flan with a generous pour of evaporated milk. Missing from the Kalan Kitchen version was the ice and the evaporated milk. The chefs really pulled off their deconstructed version of the Philippine Halo Halo according to my taste palate. It was imaginative and simply crazy, because it was so unlike the traditional way to make it. I loved every single component that accompanied this dessert, for instance, the Calamansi Curd. It was sweet and tart, which added a little zest to this dessert. The Ube Crumble married well with the Toasted Coconut Sorbet. The crumble was very buttery and very purple as one would expect from Ube, a Purple Yam that is a predominantly used ingredient in Filipino desserts. The Pandan Pearls added the “vanilla” flavoring and the Cashew Dacquoise gave the Halo Halo a layer of crispy texture. The Sweet Red Bean Sauce served on the side and added to the Halo Halo transformed this otherwise frozen dessert into a warm and cozy one. 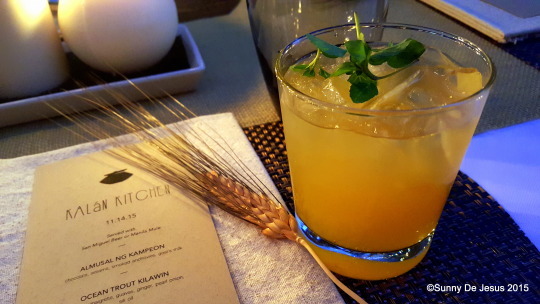 Kalan Kitchen by Chefs Kyle Barretto and AJ Santiago was absolutely incredible. I didn’t have any expectations when I arrived for dinner. I figured that I will give this Filipino Dinner Pop-up an unbiased opinion based soley on my own super taste buds. As a matter of fact, none of us attending the dinner had a clue as to what the menu would be as it was never given to us when we made the reservation. So in a sense, we were at the mercy of the chefs to prepare us a good meal. Chefs Kyle Barretto and AJ Santiago indeed gave us an impressive display of their interpretation of Filipino cuisine before we got to meet them. In other words, the food spoke loudly and clearly. Note that reservations for their pop-ups does require a prepayment to attend.